Former U.S. Federal Reserve chair Janet Yellen is “not a fan” of bitcoin. Speaking at the Canada Fintech Forum on Monday, Yellen, who served as chairman of the Board of Governors of the Fed between 2014 and 2018, outlined a number of concerns she has with bitcoin in general and the idea of central bank-issued cryptocurrencies specifically. Yellen spoke about price volatility, investor risks and the threat of hackings in a five-minute speech, according to a video posted online by Francis Pouliot. Yellen has previously described bitcoin as a “highly speculative asset” in testimony before Congress. Months prior, a separate (and unrelated) appearance by Yellen before a Congressional committee featured a now-infamous “Buy Bitcoin” sign appearing behind the former Fed chair. This is due in part to bitcoin’s decentralized nature, she said. Moreover, Yellen argued bitcoin’s energy use is “very high” when compared to traditional payments rails, which she believes is another sign that bitcoin is not an effective form of currency or a stable source of value. Regarding central bank digital currencies, Yellen took aim at other perceived issues. For one thing, central bank-issued cryptocurrencies “could have negative impacts on financial stability,” she said. 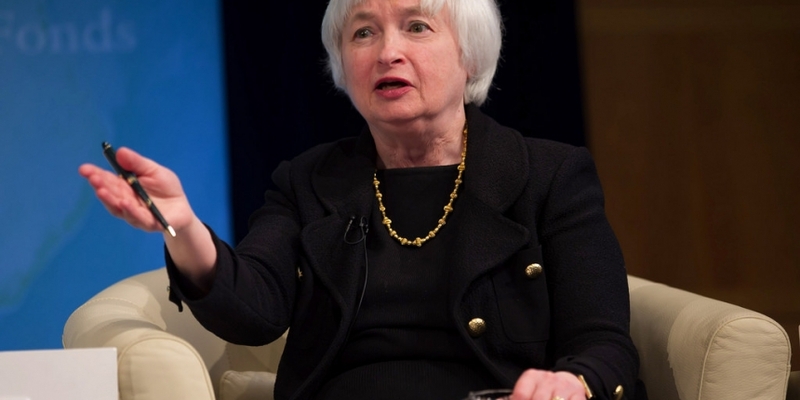 Other concerns revolve around cybersecurity, Yellen contended. Global anonymous currencies “would be an obvious target for cyberattacks,” according to the former Fed chief.